The Brew Lounge: A growing CANarchy is afoot. Deep Ellum joins the team. A growing CANarchy is afoot. Deep Ellum joins the team. 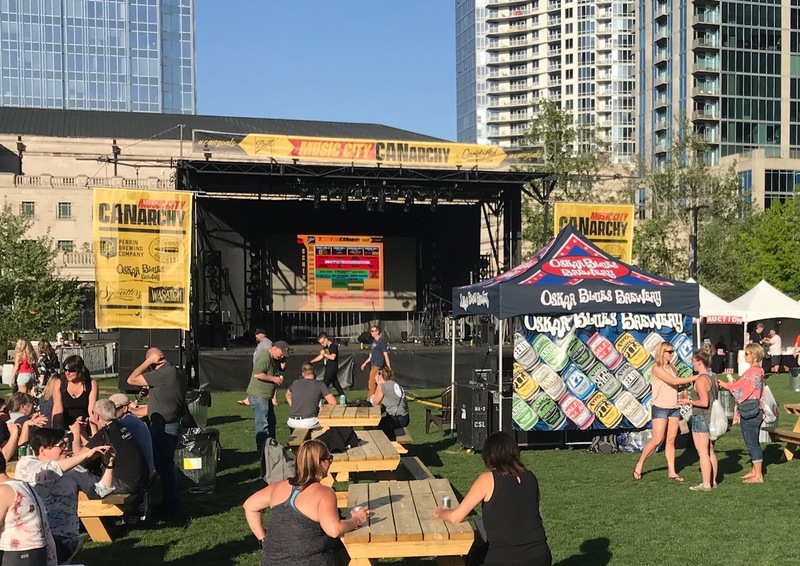 I'll admit that when I saw the multi-day, outdoor CANarchy event in Nashville during the Craft Brewers Conference last month, I thought it was just a marketing play on words to promote an event. 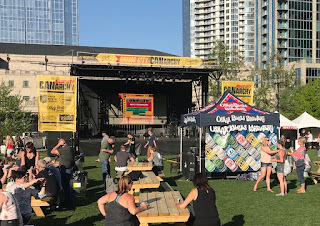 Then, after a little extra effort and scrutinizing the participating breweries (Oskar Blues, Cigar City, Perrin, Wasatch, and Squatters), I came to learn that it was the umbrella name for their new company collective. Now they have one more on Team CANarchy — Deep Ellum. I've drank the beers while elsewhere in Texas, but haven't been to the rollicking Deep Ellum neighborhood in Dallas for nearly 15 years in the time that it was just growing up. Take it away, press release. DALLAS, TX - JUNE 12, 2018 - Deep Ellum Brewing Company is the latest craft brewery to join the CANarchy Craft Brewery Collective. For Deep Ellum, a craft brewery with rough edges and deep roots in the Deep Ellum neighborhood of Dallas, Texas, the move to join the disruptive collective of independent brewers will immediately provide resources for increased production and distribution. Founded in 2011 by John Reardon, Deep Ellum Brewing Company quickly grew to become the third largest independent craft brewery in Texas, led by its flagship brews, Dallas Blonde and Deep Ellum IPA. In 2017, Deep Ellum grew 37% to produce more than 45,000 bbls in Texas only, with the vast majority being consumed within 20 miles of the brewery. CANarchy provides a platform from which rapidly growing craft breweries seeking high level resources can expand and compete in the increasingly competitive craft beer segment, while maintaining independence. The platform is driven by individual brewery culture, giving brewers control of their businesses and brands, while providing resources and support to scale their respective operations. “Deep Ellum Brewing has created a strong community and now they’re facing next-level challenges that we’ve seen before. Within CANarchy, we can solve those problems in our own way,” said Joey Redner, founder of Cigar City Brewing, who joined CANarchy in June of 2016. After immediately addressing capacity issues, CANarchy was able to assist Cigar City Brewing to expand distribution and increase shipments 43% from 65,000 bbls to 92,000 bbls in 2017. “CANarchy’s culture thrives on collaboration among craft breweries blazing their own path and doing things their own way. John and the Deep Ellum crew light the fire of craft beer in DFW and will bring that same fire to our collective,” Dale Katechis, Soul Founder of Oskar Blues, said about the new partnership. “During my time at the University of Colorado I specifically remember my first can of Dale’s Pale Ale, and that experience is part of the reason I’m in this business. Joining a collective of such irreverent and disruptive founders and leaders is exactly what Deep Ellum has been looking for,” said John Reardon. Deep Ellum is currently undergoing a large expansion, including a 60-barrel brewhouse at the company’s primary facility that is expected to come online within the next few months. The brewery is operating at maximum capacity and is projecting 55,000 bbls of production in 2018. Deep Ellum is also constructing a taproom in Fort Worth, Texas, that will incorporate a 5 bbl Brewhouse and retail space that is scheduled to open in late fall of 2018. CANarchy was recently ranked #9 on the Brewers Association’s list of the 2017 Top 50 U.S. Craft Brewers as ranked by sales volume. The portfolio includes Oskar Blues Brewery, Perrin Brewing Company, Cigar City Brewing, Squatters Craft Beer and Wasatch Brewery. The collective is the #1 provider of American craft beer in a can and has driven Cigar City Brewing’s Jai Alai IPA and Oskar Blues’ Dale’s Pale Ale to the #1 and #2 sold craft can six packs in U.S. Grocery. Terms of the transaction are not disclosed. Founded in 2015, CANarchy is a disruptive collective of like-minded brewers dedicated to bringing quality and innovative flavors to beer drinkers in the name of independent craft beer. The portfolio of craft breweries, partially funded by Fireman Capital Partners, including Oskar Blues Brewery, Deep Ellum Brewing, Perrin Brewing Company, Cigar City Brewing, Squatters Craft Beer and Wasatch Brewery and newly added Deep Ellum Brewing Company, is challenging corporate convention to preserve independent craft beer culture. CANarchy is the #1 provider of American craft beer in a can by bringing value to distributors, retailers and beer drinkers. CANarchy was recently ranked #9 on list of the 2017 Top 50 U.S. Craft Brewers as ranked by sales volume. Cigar City Brewing Jai Alai IPA and Oskar Blues’ Dale’s Pale Ale are currently the #1 and #2 sold craft can six packs in U.S. Grocery. The CANarchy platform brewed over 350,000 bbls in 2017, reaching all 50 U.S. states, Washington, D.C., parts of Canada, Puerto Rico, Sweden, Norway, Finland, Spain, France, the Netherlands, Belgium, Luxembourg, the U.K., Ireland, Australia, New Zealand, Chile, Brazil, and South Korea.